"The dead have taken command of the sea…" Disney has revealed the first full-length trailer for Pirates of the Caribbean: Dead Men Tell No Tales, directed by the two Norwegian filmmakers who made the fantastic film Kon-Tiki. 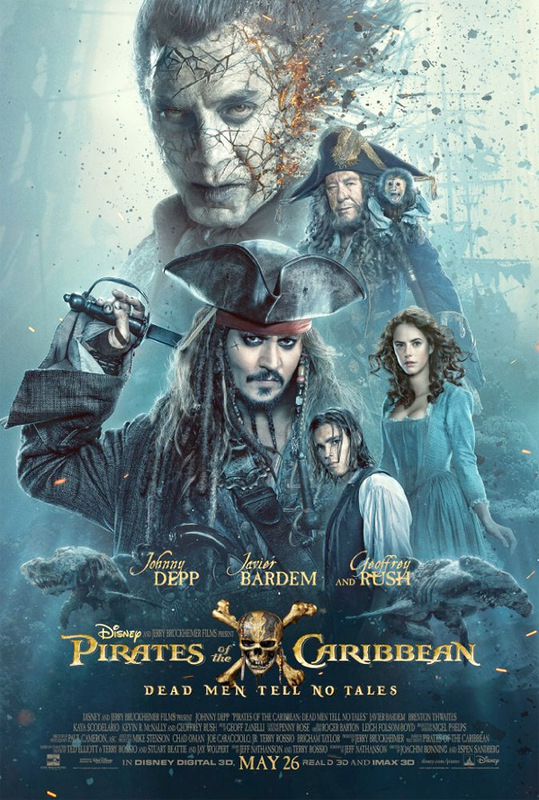 Following up the first teaser trailer and Super Bowl spot, this trailer finally shows Johnny Depp back as Captain Jack at the helm again, as well as Javier Bardem as Captain Salazar who has a vendetta against Jack, and Geoffrey Rush as Barbossa. The full cast includes Brenton Thwaites, Kaya Scodelario, Orlando Bloom, David Wenham, Kevin McNally, Golshifteh Farahani, plus surprises from past films. As usual, there are some crazy cool visuals in these movies, but I'm not sure if it'll be any good. I already lost interest in this series after the last movie. This doesn't seem so bad at first glance. You can still see the first teaser trailer for POTC: Dead Men Tell No Tales here, or the Super Bowl spot here. Captain Jack Sparrow finds the winds of ill-fortune blowing even more strongly when deadly ghost pirates led by his old nemesis, the terrifying Captain Salazar, escape from the Devil's Triangle, determined to kill every pirate at sea… including him. Captain Jack's only hope of survival lies in seeking out the legendary Trident of Poseidon, a powerful artifact that bestows upon its possessor total control over the seas. Pirates of the Caribbean: Dead Men Tell No Tales is co-directed by Norwegian filmmakers Joachim Rønning & Espen Sandberg, of Max Manus: Man of War, Kon-Tiki, and "Marco Polo" previously. The screenplay is written by Jeff Nathanson (The Terminal, Rush Hour 3, Tower Heist), based on the characters from the original Pirates of the Caribbean movie. Disney will release the sequel Dead Men Tell No Tales in theaters everywhere starting on May 26th this summer. Is anyone actually looking forward to seeing this?